Cute Loose Fitting Tops and Dresses! Best (but Cute!) 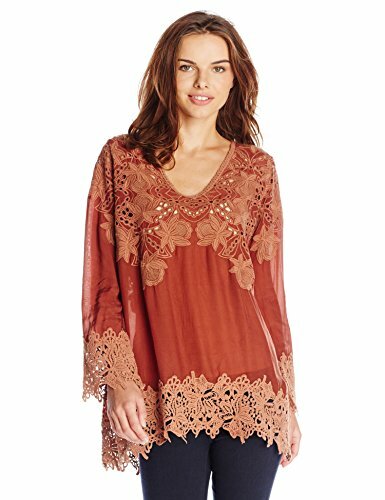 Loose Fitting Tops and Dresses for Women! Let’s face it: unless we are gorgeous size 0 supermodels and we have a personal trainer and a nutritionist living with us and on call 24/7, at some point in our lives (or after a certain age) we are going to gain a few extra pounds. And guess where do they usually love to settle in our bodies? Ever since ‘a certain age’, these unwanted and definitely not cute fat cells have decided to take over my stomach area and the fact that I also have uterine fibroids made things get extremely worse, to the point of people confusing me with a pregnant lady when I go out. Needless to say, finding clothes that fit me properly and disguise my huge belly has been a challenge! For the past two years I have been looking for cute loose fitting tops that would totally cover my fat stomach WITHOUT making me look 8 months pregnant! I found out that the fabric also matters a lot! Actually it matters the most! It had to be a very soft fabric, that would not cling to the body at all! The reason I decided to create this page is to help other women in my situation, desperately wanting to look cute and girly again while wearing something flattering! I found the cutest and most colorful, ultra-girly loose fitting tops, tunics and dresses for sale online! My new wardrobe is finally ‘me’ again! 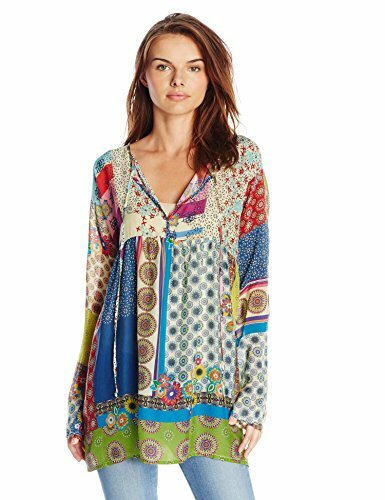 Gorgeous Loose Fitting Floral and Colorful Tunics! Rayon is our new best friend ladies! Flower prints or any other colorful design is a must! Try to avoid plain colors, specially ‘boring looking’ colors such as beige, light gray and the such because instead of disguising your problem areas it will make them worse. When we have extra-fat in our bellies and thighs we need to take the attention AWAY from them and having bold colors and prints is the way to go! *Yes, I know it is expensive but these will last for a lifetime! 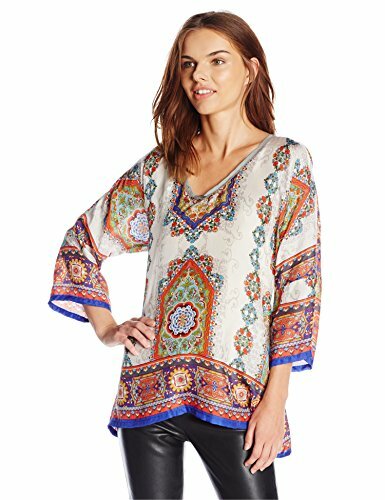 Women’s Colorful Tribal Print Poncho Style Loose Fitting Tops! 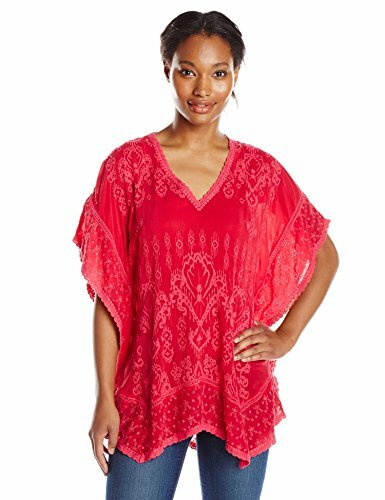 Look at this gorgeous ultra-colorful and fun ‘poncho style’ loose fitting top in a cool tribal design! It is perfect to disguise every ounce of unwanted extra-fat in our tummies! You can’t go wrong with one of these! Very Beautiful Loose Fitting Silk Blouse! Very beautiful ‘casual meets fashion’ ultra-cool looking loose fit colorful silk blouse! This is my sad situation…. Best Loose Fitting Tops for Women! Rayon is an excellent fabric to help hide extra-fat in our bodies! They are not only extremely comfortable to wear but also very flattering! I also love to wear long tops because I have a very high waist and I am very short… so when I wear long loose fitting tops and blouses I look taller, believe it or not! The one in this picture is stunning! The gorgeous ‘marsala wine’ color is perfect! 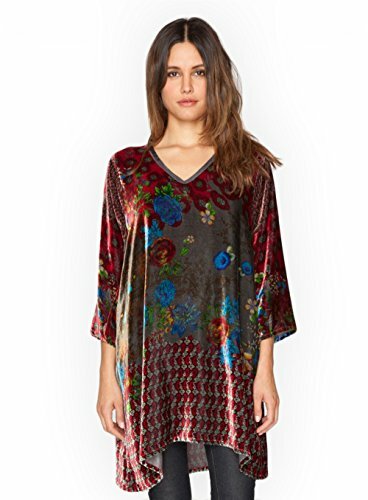 How stunning is this printed silk velvet floral tunic? Great loose fit top to go out at night! Will look amazing with a nice pair of jeans or black slacks! 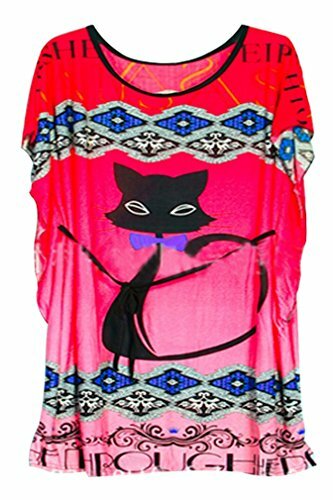 Cute, Fun, Colorful and Girly CHEAP Loose Fitting Tops for Sale! Now if you are basically broke but also in desperate need of renewing your wardrobe and filling it up with cute loose fitting tops, I think you are going to LOVE these! I personally bought several for myself too and they are adorable! They are also very long so if you are really short you can wear them as a dress. I like to wear mine with black leggings. You can find them in many, many fun colors and prints! This girly floral one is one of my favorites! Very Cute Loose Tunic Dresses! Ladies you won’t believe how SOFT this cute loose fitting tunic dress is!! The material is called ‘ice milk’ and I think it describes it perfectly! It’s totally loose on the body and it’s fun! I wear it to go to the beach, to stay home, to go to the supermarket, basically everywhere! It is made of the same material called ‘ice milk’ and it is heavenly soft and loose on the body! Girlywomen is a participant in the Amazon Services LLC Associates Program, an affiliate advertising program designed to provide a means for sites to earn advertising fees by advertising and linking to amazon.com.